The DCR-5320PRO High Definition Macro Conversion lens is particularly designed to use with the high-end digital cameras, Full-frame D-SLR, 35mm film and hi-definition cameras, resulting in a resolution power of 200L/mm at center (MTF 30%) with a low dispersion. 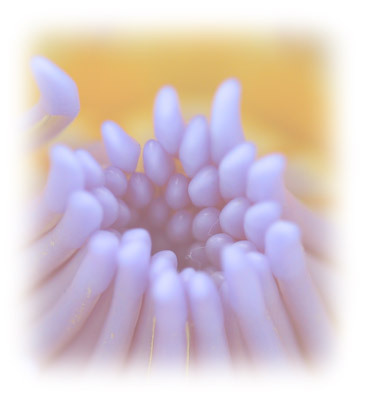 With the Macro Conversion lens attached on the camera's lens, it makes possible to approach the object very close for macro shooting. The model consists of two independent lenses, one is with 2-diopter magnification and the other with 3-diopter. 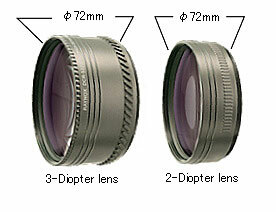 It also makes a 5-diopter lens by coupling the both lenses together. Taking advantage of using in three ways, you can shoot the object at the distances of either 50cm or 30cm or 17cm, depending upon the nature of a subject. All lens glass elements are fully coated for the maximum light transmits and fine image quality. The adapter rings which fit to the 52mm, 55mm, 58mm, 62mm, 67mm, 77mm, 82mm threads (except 72mm) sold separately. The DCR-5320PRO Macro Conversion lens is made of two independent lenses of 2-diopter magnification and 3-diopter one, both fabricated in doublet formula for less color aberration at corners. By putting the two lenses together, it creates the high 5-diopter magnification macro close-up conversion lens with the excellent high resolution power of 200 lines/mm at center (MTF30%) at center. Resolution power(Center) 200L/mm(MTF30%)-theoretical number obtained. (*the distance shown is measured from top of the lens to the surface of object when the lens is set at infinity). 8 different diopter choice of 2, 3, 4, 5, 6, 7, 8 and 10. The DCR-5320PRO Macro Conversion lenses are compatible with the latest 4K/High Definition camcorders introduced in the market lately. The shooting distance will be either at 50cm (2-diopter lens), 30cm (3-diopter lens) and 17cm (5-diopter lens) with an infinity setting of the camera lens. ● The Macro Conversion lens is a precision optical instrument assembled with the critical alignment, and do not subject it to severe shock and in environment of excessive cold or heat or humidity. Do not look at the sun or a strong light beam direct through the Macro Conversion lens. It may cause a severe damage on human eyes. Important; Do not shoot or keep your camera/camera lens with the Macro Conversion lens on, in direct sun light on the lens surface. ● It is recommended to use the 2-diopter and 3-diopter lenses with the camera lens set at longer than 50mm FL (35mm film equiv. ), and 100mm FL with the 5-diopter lens.. There may be a possibility of vignetting (darkened corners) happens when the FL (focal length) used is set at shorter than the above mentioned. ● The all figures and numbers of the lenses mentioned in this explanation were the ones obtained when the focusing distance of taking lens was set at infinity. Usually, when the focusing distance is set at nearer than the infinity, the focusing could be done at the nearer point than the described in this explanation. ● While the Macro Conversion lens is attached on, do not use the built-in flash. If you do, there would be a shadow of the lens barrel shown in the picture taken. 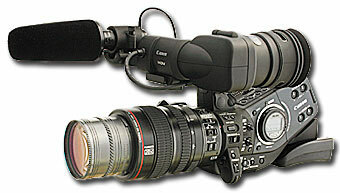 ● There might be a possibility of not functioning of a remote control when the Macro Conversion lens is attached. Please try a rehearsal shot first before using it. ● Please detach the Macro Conversion lens and put the front and rear lens caps on after completing the shooting, before carrying the camera around. ● The slight vignetting (darkened corners) could be shown on the taken picture, though it did not appear on the LCD monitor or viewfinder. ● Knowing the rather heavy weight (395g) of the Macro Conversion lens, be careful in holding the lens and camera firm for shooting. ● When using with an interchangeable lens of 35mm digital SLR camera, make focusing manually, except with the one made of an Inner Focusing system. ● Screw-thread pitch size is 0.75mm unless specified. ● The cosmetic design and optical specifications are subject to change without a notice. ● Exposing the conversion lens to a warm atmosphere in an instant way from the cold area may create some dew on and inside the lens. When it happened inside the lens, keep the lens in a dry area till the dew disappear before using. Repeating such may leave dirt spot - (mildew) and affect the image. 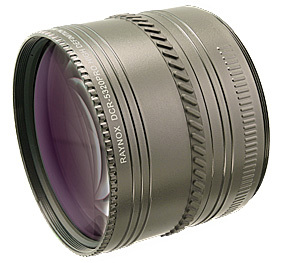 ● All of Raynox conversion lenses are proudly made in Japan. At our owned manufacturing subsidiary, every stage of production is rigorously checked and tested so that the lens elements compensate effectively for astigmatism, distortion and spherical aberration.... for an excellent image quality. ● The lens is neither made for dust-free nor moisture/water-proof. RAYNOX® is the registered trademark of Yoshida Industry Co., Ltd. Tokyo. Other brand names and the models are the trademarks of their manufactures or their subsidiaries and may be registered in certain jurisdictions.